Coll. No. 1079, 23 April 2015, characters observed: Perennial herb, to 16 cm., prior year leaves to 23 cm. ; Rhizome, unknown (none found); Culm, 11.5 cm. × 0.6 mm., ±triangular, but obscured by white striations at least when dry; Leaves, 12 cm. × 1.5 mm., ±flat, some folded ≤30°. 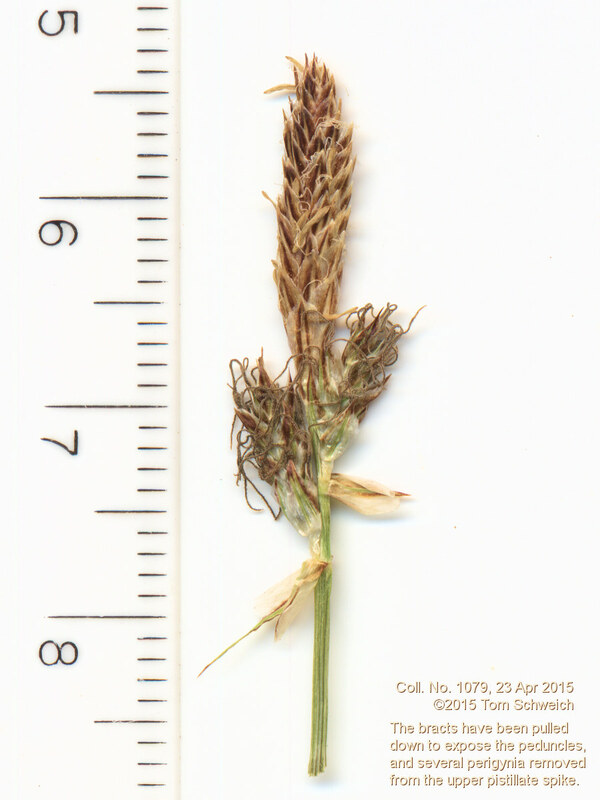 ; Inflorescence, multiple spikes, all approximate (I think this means all pretty close together), 1-2 pistillate spike(s) below, 1 staminate spike above; Bracts, lowest, blade 8 mm., sheath 4.5 mm., papery; Pistillate spike, peduncled 1.0-1.3 mm., 9 mm., brown (not black); Staminate spike, terminal, 16 mm., ovoid (not cylindric), brown (not black); Scales, >perigynum body; Perigynum, pubescent on faces, margin ciliate; Achenes, unknown. Field Notes: Coll. No. 1079, 23 Apr 2015.